Rangers have fallen short of Dave King's targets, so where are his answers? There are quite a few Rangers people who wouldn't mind putting some questions to Dave King sometime soon, the only problem being that in order to quiz their chairman face-to-face they're going to have to get themselves to Las Vegas. King doesn't do Glasgow much these days. Next month he will appear at the North American Rangers Supporters Association bash at the Planet Hollywood hotel on the famous Vegas Strip. Somewhere else in the complex, Britney Spears will continue her two-year residency with her show entitled 'Piece of Me'. In truth, it wouldn't be a bad title for an audience with King, such are the emotions swirling around Rangers right now. A week ago, Pedro Caixinha said he was "ashamed" to show his face after Rangers lost 2-0 to Celtic at Hampden in the Scottish Cup semi-final. On Saturday, after losing 5-1 to Celtic at Ibrox, he said his team had raised their level and had been better than the week before. Thirty-six points adrift of Celtic - Rangers are closer to Inverness Caledonian Thistle in last place than they are to the leaders - and nine points behind Aberdeen. The team is still on course to qualify for the Europa League but this is what it has come to for Caixinha already: compensations, contradictions, panning a historic humiliation for pieces of positivity. Confusion reigns at Ibrox. King's promise of a personal investment of £30m - where is it? This business of appointing a director of football, as announced in February - what's going on? The Takeover Appeal Board ruling against King that he should make an offer for all the club's shares, and Tab's criticism of him - what happens next? The legal action from former manager Mark Warburton and assistant David Weir - where's it at? The manager, the squad, the academy, the scouting system - is anything moving forward? An unpopular old board have been removed - a war that needed to be won - but the new board are coming under some scrutiny from their own people now. 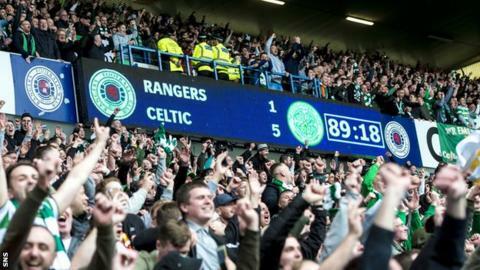 Back-to-back beatings of the kind of magnitude of Hampden and Ibrox tend to provoke a reaction. On appointing Warburton, the Rangers board, via King, said that it needed to be "an appointment that sees us through the next three years". It lasted 18 months and ended in a bitter divorce that could reach the courts. When it all went wrong, King said in a statement, by way of explanation, that Rangers had "required, at short notice, a relatively untested management team". Maybe it was an admission that they appointed the wrong man in Warburton. But why that line about "short notice"? Rangers had lots of time to make that appointment in the summer of 2015. And why "relatively untested"? They had other options, some of them vastly experienced. It was the board's decision to give the job to a relatively untested manager. Nobody made them do it. Decision-making has been of a desperately poor order at Ibrox for quite some time. When Warburton left town, Rangers were level on points with Aberdeen in second, albeit having played one game more. He had major flaws, Warburton - so many poor signings for a start - but things have not got better since he left. Having appointed "at short notice, a relatively untested management team", King would have been entitled - if not obliged - to take the lead, as chairman, in the appointment of a new management team. Why run the risk of getting it wrong for a second time? But he didn't take the lead. He said he had absolutely nothing to do with it - wasn't his function. He didn't even speak to Caixinha until he was given the job. The brief, as he has outlined in public, is for this new manager to compete for the title next season - yes, next season - as well as making progress in Europe. But King didn't see it as his place to get himself involved in the selection of the man tasked with such a gargantuan job? What Rangers have ended up with is another relatively untested management team. Is history repeating here? And if it is - whose fault is it? Remember how it used to be under King? In September 2015, while Rangers were still in the Championship, King was asked if it was possible for them to push Celtic for the league title immediately on their return to the top flight. "Definitely," was his response. "My feeling, sitting here today, is we can start next season [2016-17] intending to win the Premier League... The gap is not as big in my mind as it was three or four months ago." Positions change, of course. Reality dawns. Not long ago, King said that his expectations for this season were as follows: "I would have expected us to be equidistant between Aberdeen and Celtic. If we were 12 points behind Celtic and 12 points ahead of Aberdeen, I would have thought it was a fair position." King has made many statements and not all of them stand up to scrutiny. "You'll go far to find a single football club in the world that's got a balance sheet as strong as Rangers," he said at the club's annual general meeting in 2015. This has been the King shtick. The year before, as he fought to get rid of the boardroom regime at Ibrox, he presented a vision of a war-chest. "My view of what it will take to make Rangers competitive again is bottom end £30m but probably £50m over the next four years." King's timetable - "the next four years" - concludes in March next year. He went on: "I would say I would probably have to put in £30m of the £50m over the period of time. And I could probably get other people to put in £20m." There is now no talk of £50m and little detail about King's "personal" investment of £30m and where it has gone. He was clear at the time that this was going to be money that would be invested not in accumulating shares or paying off debt - as was done with the £5m owed to Sports Direct - but go straight into the heart of the club to improve the playing squad, the academy, the scouting, the general infrastructure. Major investment in the academy and the scouting network is still needed. The Rangers chairman recently paid tribute to the "marvellous work that has been achieved by the academy over the last two years". For sure, Barrie McKay is a product of that academy and was a deserving winner of Rangers' young player of the year award last season, but Rangers are doing a poor job in developing McKay's talents. This season's club young player of the year is Emerson Hyndman, a loan signing in January from Bournemouth. The overall player of the year is 37-year-old Kenny Miller, with 38-year-old Clint Hill probably the best of the rest. King's most recent timetable, from February, states that Rangers should be targeting a proper title challenge next season. Talk is cheap. Maybe in Vegas, while Britney is giving it laldy down the corridor, he might explain, precisely, how they're going to do it. You sense that there's a growing number of concerned Rangers supporters who'd quite like to know.